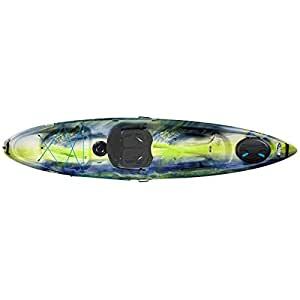 The Pelican Premium Strike 120X Angler is a simple and easy-to-paddle kayak for the discriminating fisherman. Built on a multi-chine flat bottom hull, this 12-foot-long sit-on-top fishing kayak provides a high level of stability, great maneuverability and tracking, and plenty of storage space. With its clean lines and sleek design, the Strike 120X Angler features adjustable footrests and the ErgoFit Seating System for increased comfort, a quick lock hatch, an 8″ day hatch with storage band and a tank well with bungees to store your fishing gear, swivel and flush mount rod holders, a paddle tie-down, accessory eyelets and an angler ruler. Made of RAM-XTM PREMIUM, a multi-layer, polyethylene with an advanced resin providing significantly more rigidity than standard polyethylene, it is lighter, stiffer and stronger.